i've been talking to my best friend, kimmy.......a LOT, lately. like, i'll call her at midnight......and next thing ya know? it's 6a.m. and i H A T E phones. i lose time with this girl, though. she's my UNbiological sistuh, thru and thru. we talk about our past, but we also talk about the present, future and way BEYOND....she's fuggin' B-A-U-T-ful on a stick. with an extra dollop of whipped cream. plus, a little choco-latte. so, turns out she brought one of her girlfriends over the other night to see one of MY works that's been hanging in her beddy room, since forever ago. i gave this drawing to her decades ago because i knew she appreciated it, i knew she was an art history major, aaaaaaaaand i knew i would've just chucked the fucker away, cuz....well, that's the way i am. 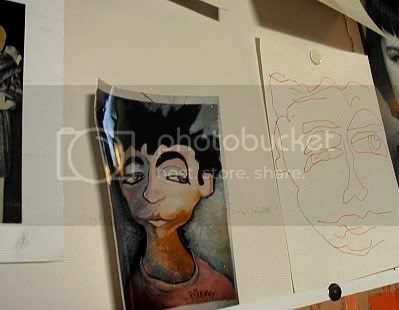 so, this is the shot kimmy took nearly 20 years ago of said artwork (above left), in my collegiate studio. she has since named this oil stick drawing on watercolor paper (dimensions unknown....but, it's bigger n'a bread box and smaller n'an SUV.) 'noel/neal,' cuz it reminded her of one of her other art buddies. it's one of my favorite pieces, and i'm sooooo glad i didn't trash it......it's in good hands though, and always will be. maybe kimmy'll have a retrospective of my work one day.....and maybe i'll be alive to witness it??? that'd be way cool. I really like that painting...I'd want to know that dude. He looks cool. oh, he's joe cool, alright. although, he should really learn how to use a napkin. LOvE this post!!!! and i can't wait to have that retrospective and yah, you better meet me in the bathroom with the choc-chippers! did i mention the dream i had of you in the museum???? have to save that one for another all night laugh/talk fest. (did i really take that picture??? wow!!! some day we'll have to dig out all of our pix, cuz i bet we each have some that the other doesn't have and i'll beet we'd have a beeeeelast looking at them all! i seem to remember you taking a bunch of me around campus that day in oct of '87...i remember, cuz i had just started dating kal when you visited. yea, my memory isn't THAT bad!! anyway, you took shots like the andy warhol-esque one and a few in my studio. and we SHOULD have a picture party night, that would be hugely fun!! !